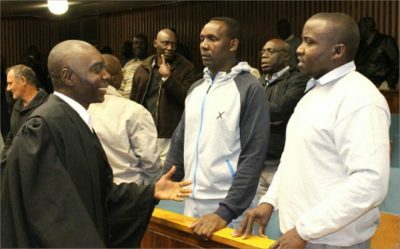 The case in which Afumba Mombotwa (60), Pelekelo Likando (64) and Sylvester Inambao Kalima (57) have appealed against their high court conviction and sentencing of 10 years imprisonment, with hard labour, for treason-felony is scheduled to take place in the Supreme Court of Zambia to convene in Ndola on Tuesday, the 4th of September, 2018, according to documents obtained by the Barotseland Post at the Supreme Court Registry. In this appeal, the three appellants will be represented by their lawyer, Counsel Victor Chibvumbu Kachaka, who is renowned for defending a high-profile case involving dozens of treason-accused Namibians charged or convicted over secession-related matters in the Caprivi Strip, now Zambezi region of Namibia. Confirming his professional interest in the case, Counsel Kachaka said he was looking forward to arguing in court that his clients did not belong in jail at all. On the 9th day of March 2016, the accused, Afumba Mombotwa – A1, Pelekelo Likando – A2, and Sylvester Kalima Inambao – A3 were charged and convicted upon trial of the offence of treason felony Contrary to Section 45(b) of the Penal Code, Chapter 87 of the Laws of Zambia.